The Royal Welch Fusiliers was a line infantry regiment of the British Army, part of the Prince of Wales' Division. It was founded in 1689 to oppose James II and to take part in the imminent war with France. 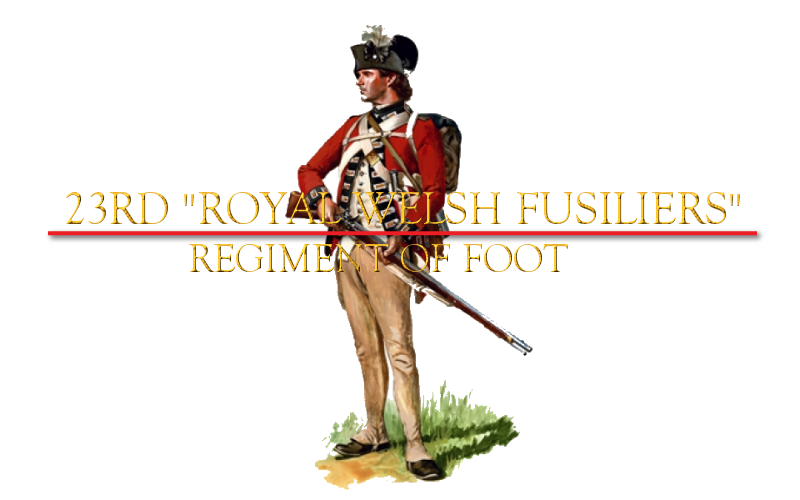 The regiment was numbered as the 23rd Regiment of Foot, though it was one of the first regiments to be granted the honour of a fusilier title and so was known as The Welch Regiment of Fusiliers from 1702. The "Royal" accolade was earned fighting in the War of the Spanish Succession in 1713. It was one of the oldest infantry regiments in the British Army, hence the archaic spelling of the word Welch instead of Welsh. In the Boer War and throughout the First World War, the army officially called the regiment "The Royal Welsh Fusiliers", but the archaic "Welch" was officially restored to the regiment's title in 1920 under Army Order No.56. During those decades, the regiment itself unofficially used the "Welch" form. The regiment was amalgamated with the Royal Regiment of Wales (RRW) on 1 March 2006, to become the 1st Battalion, Royal Welsh (RRW becoming the 2nd Battalion). The regiment primarily recruited from North Wales. It should not be confused with the Welch Regiment, which recruited from South and West Wales. Lieutenant Colonel Speirs or Major Ben on Steam! You can also join our Steam Group.